Lindsey Anderson sat down with Greg Dejonghe and talked about the big boom, truck-mounted market in North America and the outlook for '16. Lindsey Anderson spoke with a number of rental companies from big to independent to feel out the coming year. ‘Mixed bag’ might be the best way to describe it. 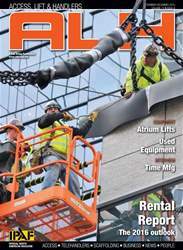 ANSI STANDARDS Everyone in the industry should start preparing now for the new aerial standards soon to be released. 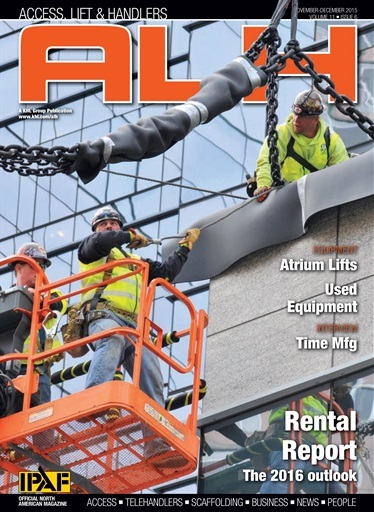 Brad Allen, with Terex Aerial Work Platforms, discusses. The channels in which buyers can purchase used equipment have changed drastically. Lindsey Anderson reports on the used equipment market and next year. The Rental Show 2016 will be the ARA’s 60th annual convention and trade show. ALH previews the event. World of Concrete is set to take place Feb. 2-5 at its usual home in Las Vegas. ALH previews the event.